Are you itching to indulge in the unbridled beauty of rolling garnet and amber hills? Fall is here, and for anyone thirsting for fire­-lit nights under the stars and the crunching of forest leaves beneath their feet there is no shortage of sights to see. 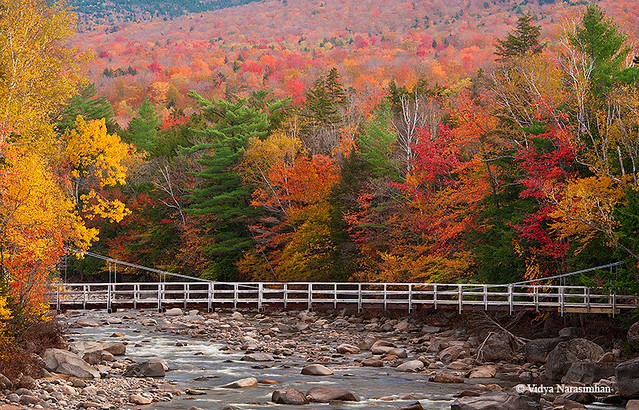 The U.S.A. is home to some of the most breathtaking fall scenery in the world. So, grab that sleeping bag and pack up the car for a weekend camping adventure. Without further adieu, here are 21 of the most beautiful, awe-­inspiring places to camp this season. 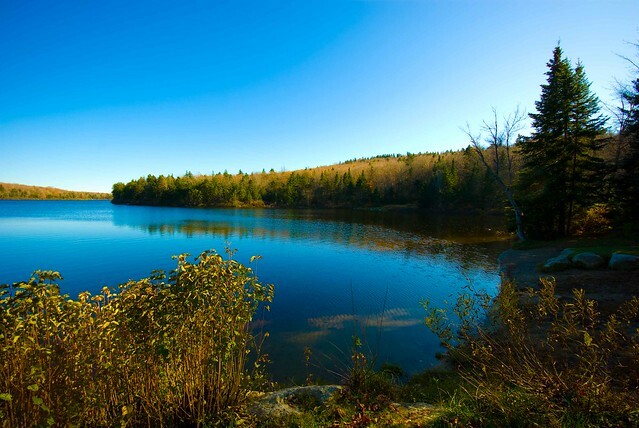 The Grout Pond Recreation Area is open to campers and nature enthusiasts year-­round. If you’re seeking solitude you may be in for a surprise– this spot is a popular location for a wide array of cold­weather activities. People love it for a reason, it’s a wonderful place to engage with the majestic allure of fall. Ten miles of hiking and snowshoeing trails, and plenty of boating opportunities, make this the perfect place to pamper your inner athlete. Acadia is a park of contrasts, where land meets sea, forest meet marshes, and mountains pepper the horizon. The forests of Acadia are particularly green during the fall, dappled with shades of gold and deep maroon from the occasional oak or maple. Above all else, this National Park is perfect for anyone thirsting for seaside adventure. Rolling hills and beautiful geological features cascade into aquatic realms, adding a touch of the unexpected to the majestic beauty of a New England fall. 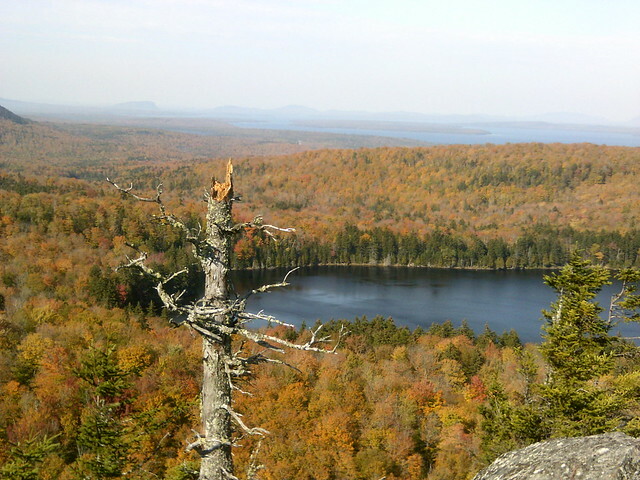 The White Mountain National Forest is brilliant during the fall season. Gentle brooks and soft hillsides complement the multi colored symphony of the season. The history of this place is just as unique as the ambiance, much of it is a commemoration of some of the earliest reforestation efforts. Though much of the forests may seem old, large areas of the park have actually been reformed in the last 100 years. It’s a wonderful place to experience and reflect on the long­-term impact of environmentalism. This Rhode Island Park stands at the precipice of the beautiful New England forest and the stormy Atlantic, making it an unusually beautiful camping destination for fall. 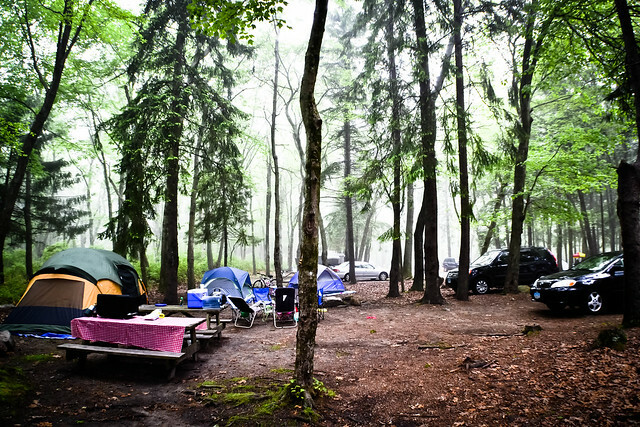 Jagged coastal beaches and misty weather complement the dulling leaves of the surrounding shrubbery, adding an element of mystery to this spooky camping trip. Though it’s not advised to swim during the crisp fall months, there is always more than enough fishing and hiking to satisfy even the most seasoned sea­-lover. 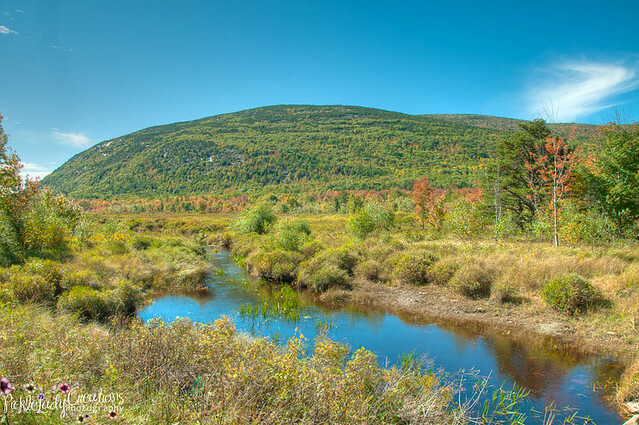 One of the few New England campgrounds that stays open year­-round, Little Moose has all the fall charm you could hope for. The mountain this park is named after has some of the finest views in Maine, offering over 15,000 acres of breathtaking hiking, hunting, snowshoeing, and canoeing to its guests. The campsites are all bare­-bones primitive sites, so this is the perfect place to immerse yourself in the bounty of the landscape and disconnect with the hustle and bustle of modern life. The Allegheny Plateau is Pennsylvania’s natural gem, and Prince Gallitzin State Park lies just on the southern edge of the famed territory. The park is a haven for athletic activity: it has over 32 miles of the area’s finest hiking, mountain biking, horseback riding, and disc golfing– all dipping into and out of the perfectly hilled terrain. The landscape hugs views of the Glendale Lake, where nature enthusiasts and sportsmen alike can enjoy fishing, kayaking, and more. Between Meridian and Jackson Mississippi the Roosevelt State Park reigns. Jeweled with bright shades of gold and deep hues of smoky charcoal, this state park has some of the most striking natural views in the American South. Better still, the park has some unusual amenities, including bathhouses and musical performances at several amphitheatres. 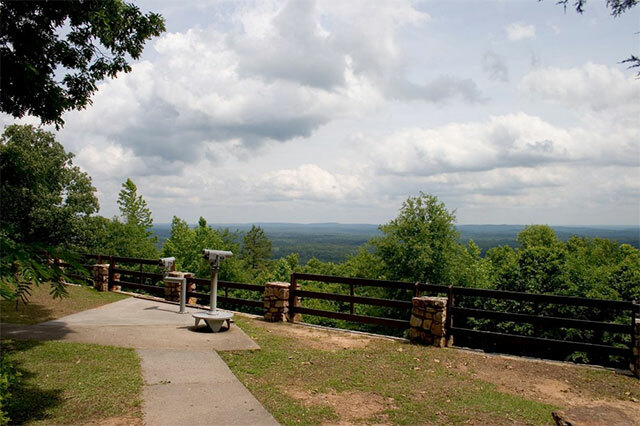 The forgiving hills of this southern gem make it a relaxing and fun place for all skill levels to hike and explore. 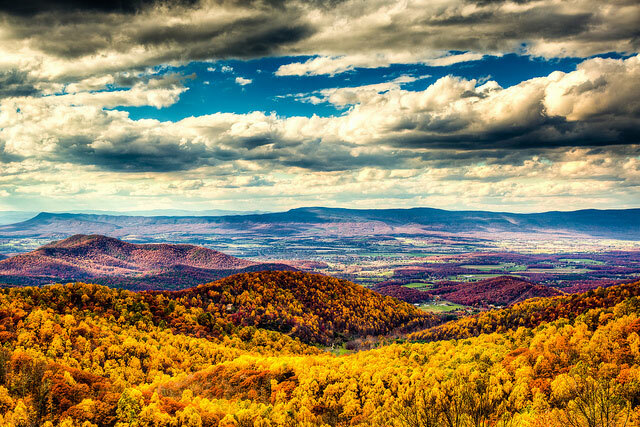 There is little more spectacular than the Blue Ridge Mountains during fall. A few hours from Washington D.C., Shenandoah National Park is an idyllic place to explore over 2000 acres of pristine forests, all dawned in a hundred different shades of maroon. Hickories and maples cast a deep golden glow throughout the forest, offering a truly unique visual experience. It’s location just between the Northeast and the South make it temperate enough to visit in the late fall, when many of the most gorgeous New England parks become clad with snowfall and close down. Pisgah National Forest is most famous for it’s majestic white water. The contrast of brilliant silver waterfalls and rivers on a backdrop of marigold and spice make for a unique sensory experience. 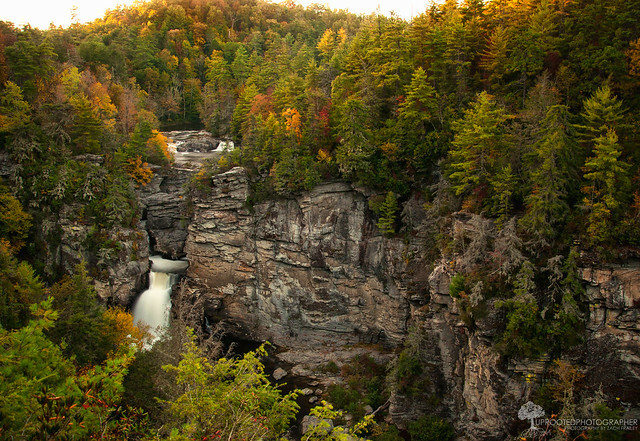 The Blue Ridge Parkway has several campsites, with jaw dropping hikes, especially Linville Falls, dubbed the most photographed waterfall in North Carolina (and with good reason). The Great Smoky Mountains are America’s most visited National Park, and that is no exception during the fall. With some of the most varied and bountiful plant and animal life in the nation, there is no shortage of things to do and seek in this natural treasure. Many of the mountainside trees lose their leaves early in fall, adding an unusually rich texture to views of the expanse. The Deep Creek campsite is beautiful just before it closes in late October, offering some great fishing, hiking, biking, and waterfall views. 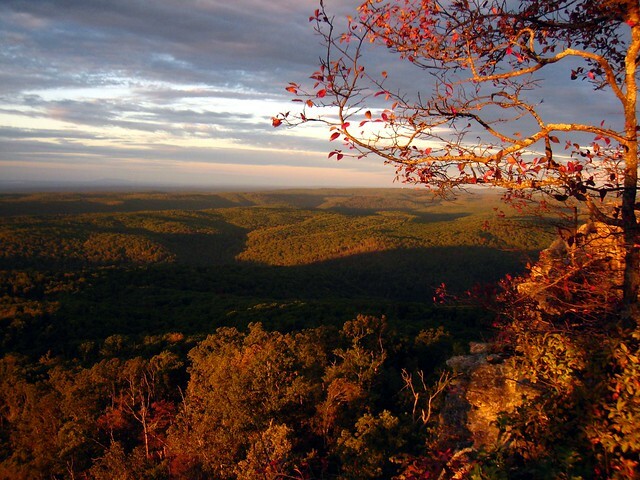 The Ozark National Forest is a true southern jewel. Covering over a million acres of land, it’s one of the largest National Forests on in the American South. Though early fall rains temporarily shut down some of the best campgrounds, there is no reason to miss the beautiful views and phenomenal fishing at Ozark. One of it’s most popular attractions is a living underground cave system, The Blanchard Springs Caverns, undoubtedly one of the most other­worldly places to explore on this list. Spelunking tours are available well into the fall, and it’s an immersive adventure you wouldn’t want to miss. The ‘Grand Canyon of Texas’ is dubbed one of the best places in the United States to star gaze. On most nights you can see bands of the milky way stretching across the skyline. 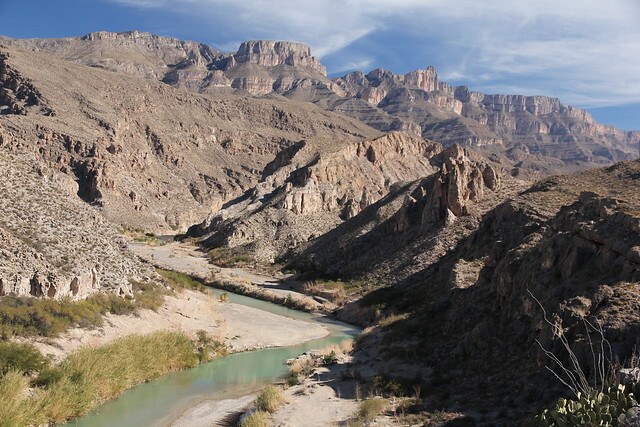 Located just between the border of the U.S. and Mexico, Big Bend National Park is mountainous desert terrain worth visiting in the fall season, when some of the park’s most beautiful hiking trails aren’t strained by the scorching summer heat. A few of these trails are only accessible in the colder months, so fall is the perfect time to take advantage of this unique space. 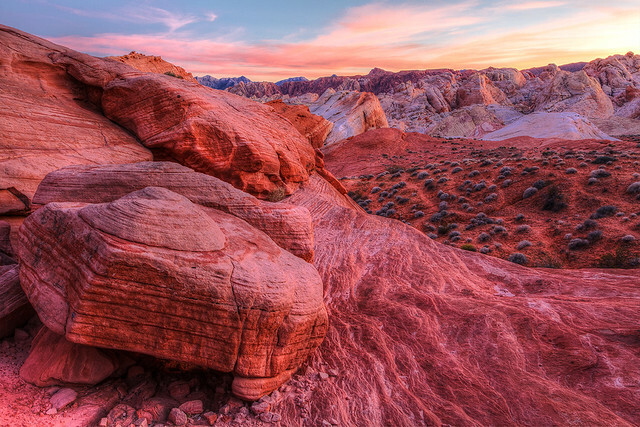 Located just an hour from Las Vegas, Valley of Fire State Park is an unexpected fall escape. There, the brilliant gold and red hues of the season are present year­-round– not on the forest floor, but on massive ancient sandstone formations and desert scapes. 75 degree days make this season the most comfortable time to explore the curving red dunes and ancient petroglyphs left by the Anasazi tribe thousands of years ago. 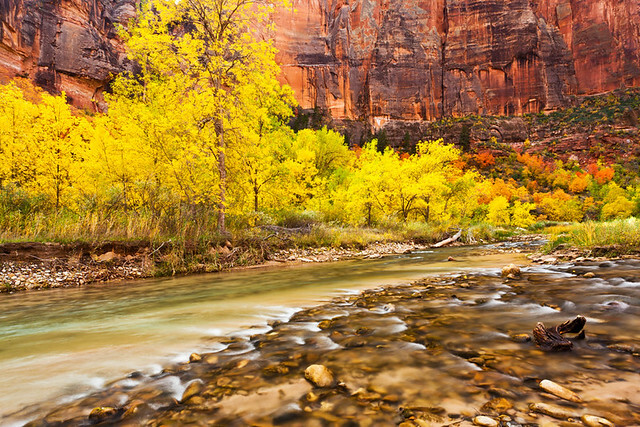 Zion National Park is extremely popular for campers from around the world. This park has it all! 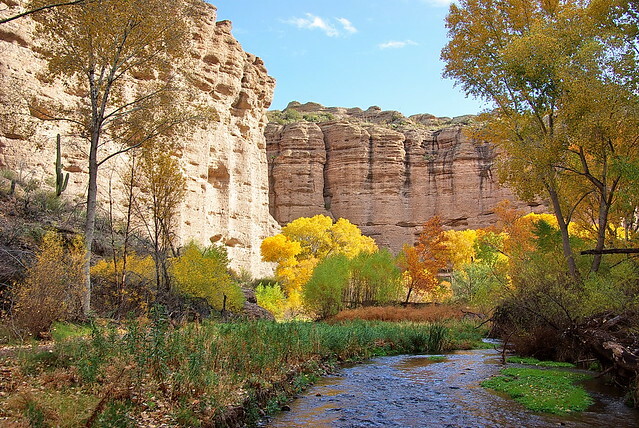 From 2,000 foot Navajo cliffs to waterfalls to sandstone formations to crystalline springs, you could easily spend days taking in all the natural beauty this place has to offer. 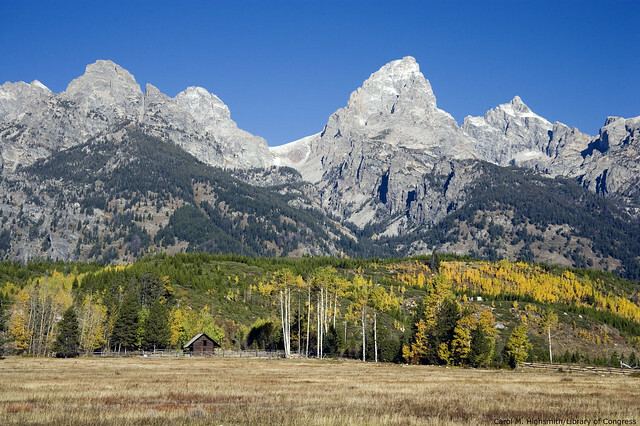 Settled between the Mojave desert and the rocky mountains, the region is spectacularly diverse. This is the perfect landscape for those that want to see it all. Yosemite is perhaps best known for its breathtaking waterfalls, but the park is truly so much more. 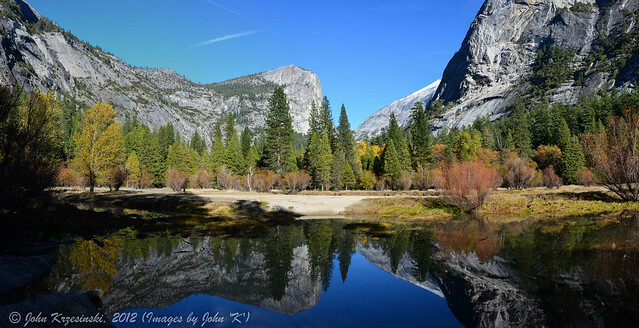 A great escape from the urban sprawl of Southern California, Yosemite boasts over 800 miles of hiking and an unlimited number of things to see and experience. Several campgrounds open in the height of Yosemite’s fall beauty offer up some of the most inspiring scenery in the South­West. Haunting views of massive evergreens and waterfalls make it a memorable destination for your fall camping trip. Joshua Tree National Park is one of the more unconventional desert locations on our list. 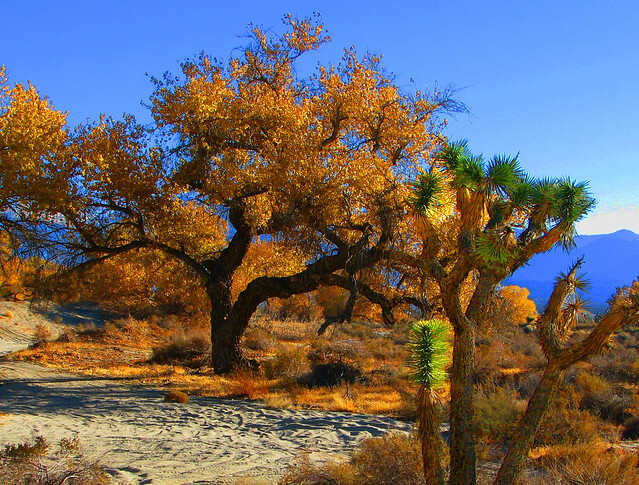 Namesake of the famed U2 album, Joshua Tree has a unique and atmospheric quality worthy of a fall visit. This Mojave Desert gem has some of the most magnificent night skies in Southern California. The most notable aspect of the park, of course, is the bizarre and beautiful Joshua Tree. This strange, spiked plant may not boast the brilliant hues of fall, but it can awe in any season– especially in the temperate fall weather. 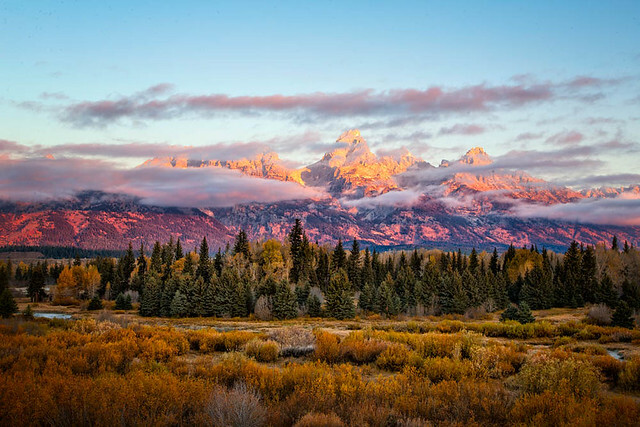 For anyone looking to indulge their inner mountaineer, Grand Teton is the place. Rich green alpine forests skirt this beautiful mountainous region, dipping into the Snake River and meadows of grazing elk. We highly recommend you bring a camera, since the dazzling mountain views here make for idyllic christmas cards. The scenic rafting and horseback riding trips are particularly peaceful as summer crowds dwindle. If you haven’t been to Yellowstone, or if you just went for Old Faithful, you’ve been missing out on a gorgeous experience. This enormous national park is particularly yellow in the fall, who would’ve guessed? Towering pines and amber meadows contrast the mists of geysers and hot springs that spread throughout the park, a constant reminder of the heat that lies just below the earth’s surface. No matter the season, the geology of this place is too fascinating to miss. 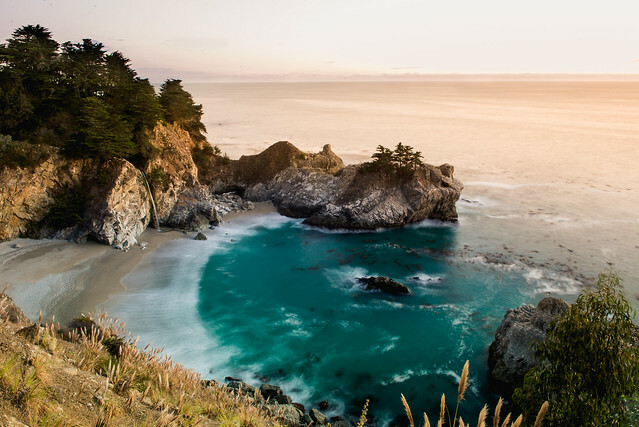 If there’s one thing that comes to mind when experienced campers think of Big Sur, it’s redwoods–lots of them. These unfathomably massive trees that line the Big Sur river make this camping spot one of the most mystical places to visit in the fall. Big­-Leaf maples and cottonwoods along the bases of massive redwoods exemplify the sunset hues of the season and add vibrant color to the memory of your trip. If there’s one thing a die­-hard naturalists wants to escape, it’s a crowd. The problem with visiting The Grand Canyon during the summer months are the masses of tourists that sully all the best snapshots. School sessions make the fall an odd time for families to travel, so barely-­there crowds make this the perfect best time to experience the beauty of The Grand Canyon. Like so many natural areas in the southwestern region, more of the most varied and interesting trails are open and available for your hiking pleasure in the fall, when the risk of dehydration and heat stroke is at a minimum. 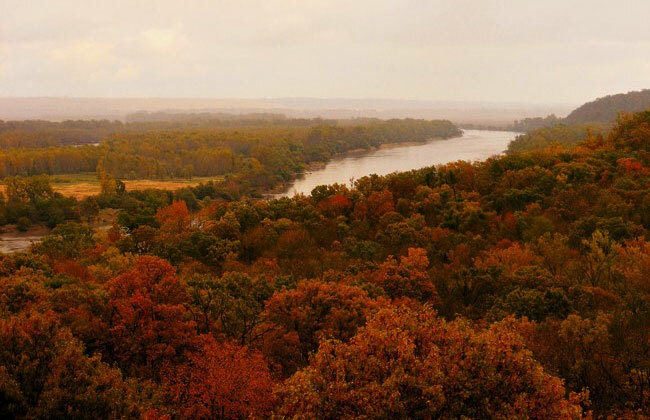 Indian Cave State Park has stunning views of the Missouri river, with beautiful rock formations along its banks. The Fall months are remarkable at this park, where views of delicately curved formations provide a fascinating glimpse of prehistoric carvings along the cave walls. The gold and red hues that envelop visitors on either side of their romp through the caves make it a particularly enveloping fall experience. This is a guest post by camping enthusiast Michelle Martin.